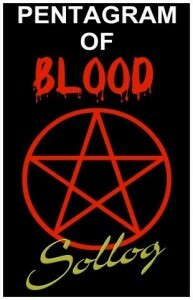 Is the Pentagram of Blood Real? In the middle 1990’s exact details of this phenomena were put into a US Federal court case by the author of Pentagram of Blood who is Sollog. Sollog was falsely arrested by the US Secret Service after the Oklahoma City Bombing when he faxed over 60 major figures in the US Media the exact details of the Oklahoma City Bombing. Since then Sollog has amazed his legend of fans around the world with his PROPHECIES that are now part of Internet Legend. The fact is in the middle 1990’s Sollog gave exact details of where the Pentagram Of Blood would form, as to the lines on a map of the USA and the types of historic mass loss of life events that would strike the Pentagram of Blood OVER AND OVER. Sollog says these events are manipulated by HIGHER INTELLIGENCE so humanity will listen to his warning about the future and how mankind must get rid of all nuclear technology. The Pentagram of Blood was created to GIVE YOU THIS WARNING.